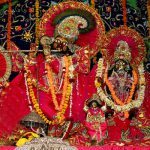 Devotees throng by the tens and hundreds of thousands every year, and especially during the month of Karttika, to have darsana of Sri Sri Radha-Damodara and to circumambulate the temple. 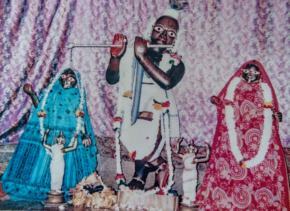 The Deity of Damodara with Sri Radha to His left and Sri Lalita to His right is the eternal blackish form of Sri Krsna appearing in Vraja to satisfy the desires of His pure devotees. But much to the amazement of the observant devotee, Sri Damodara has changed His blackish colour to that of an effulgent brown! 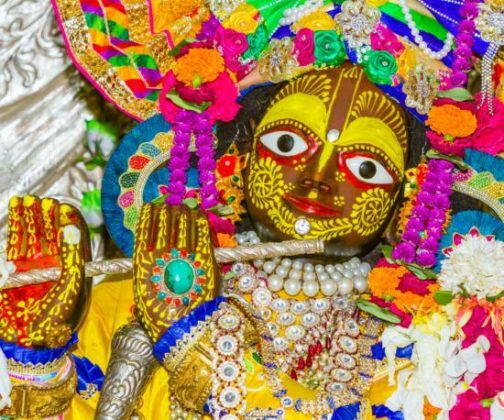 Not only has Damodara changed His colour, but all the original Deities of Sri Krsna in Vraja, and those that have gone elsewhere such as Govindadeva and Gopinatha in Jaipur, are changing their colour to brown as well! This is indeed a mystery. We first began noticing this transformation of Damodara about 15 years ago when we observed small brown spots appearing on Damodara’s chest, arms, legs and face. 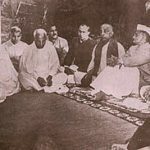 This brown blemishing continued until such time that the Deity manifest as an effulgent brown colour from head to toe. 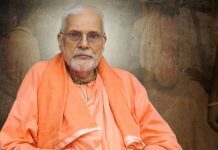 Then, about a year ago, we began to notice a similar transition of colour in all the ancient Deities of Vraja and also in more contemporary Deities such as Vrndavana-candra, established by Krsna Dasa Kaviraja Gosvami. Were we witnessing some sort of miracle or possibly the result of some aparadha (offense)? 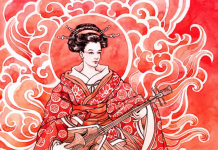 What was the cause of this occurrence, or could it simply be the sweet lila of the Lord? Some research and some careful scrutiny of details was necessary. 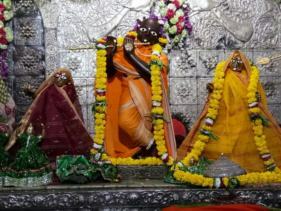 The Deity of Damodara was installed in the presence of Sri Rupa Gosvami, Sri Sanatana Gosvami and Sri Jiva Gosvami on sukla-dasami in the month of Magha 1542, seven years after Sri Jiva’s arrival in Vrndavana. 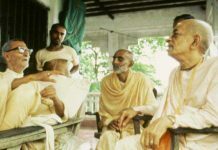 This account has generally been accepted by the Gaudiya community as historically accurate. 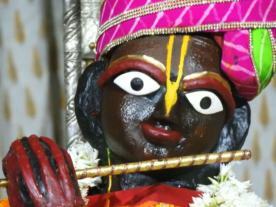 In this historical narrative, there is no mention of the colour of the Deity of Damodara being brown, so it is assumed, as in the case of all the ancient Deities of Krsna in Vraja, that He was black. The assumption is that when Vajranabha, the king of Mathura and great grandson of Lord Krsna, along with Uttara, the mother of Pariksita Maharaja, established the first Deities of Krishna in the Vraja that the Deities were hewn from black marble, possibly from Makrana in Rajasthan. 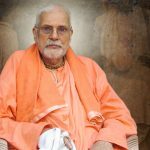 This has been the assumption for centuries among the Vaisnavas of Vrndavana, but the facts may be different. Not only did Vajranabha and Uttara arrange for the first Deities of Krsna in Vraja, but they also established four siva-lingas in Vraja – in Mathura, Vrndavana, Govardhana and Kamyavana. These lingas of Siva are also brown in colour. Ruling out the consideration of aparadha, we concluded that the original Deities of Krsna in Vraja were not hewn from marble or any black stone, but from a stone from Vraja itself. The question then arose, could the brown stone be from Govardhana? Understanding what it takes to carve a Deity from stone with a hammer and chisel, the consensus of Gosvamis from Vrndavana and the Vaisnavas in general is that the Deities would not have been carved from govardhana-sila, but were indeed carved from a stone from the hilly area of Vraja, possible from near or around Kamyavana. Thinking on this proposition it seems most reasonable and logical. 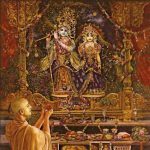 Why would Vajranabha go to the trouble of bringing black marble from somewhere in the material world like Makarana when he could have the Deity hewn from the stone of Vraja, which is non-different than Krsna Himself? The choice seems obvious. All the ancient Deities of Vraja, including the four siva-lingas, were hewn from the brown stone of Vraja and then given a black colour with churna, the ancient herbal equivalent of modern day paint. 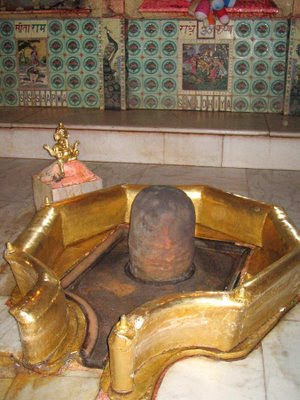 Some of the original lingams and Deities have been covered at present in white plaster or in red vermillion, but the original brown colour of the lingas can be clearly seen at the Gopesvara Mahadeva temple in Vrndavana. When first observing the change in Damodara’s colour, it was noted that a black substance was flaking off the Deity’s body that indeed looked like old paint. However, the Gosvamis at Sri Sri Radha-Damodara Temple assured me that synthetic paints have never been used on the Deity – nor were they aware of any colouring process having been used on the Deity in the past. Apparently, at some point in time, the Deity had been coloured black, but the knowledge of how this was done has been lost to memory over the centuries. 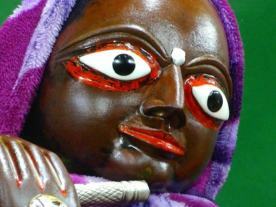 Thus, Damodara became more and more brown as the days, weeks and months went by. Our conclusions seem both logical and practical, yet one more area of inquiry remains. The time between the manifestation of the original Deities of Krsna and the time when Damodara was manifest is approximately 4,500 years. 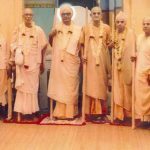 How did Sri Rupa Gosvami know that 4,500 years before his time, Vajranabha had hewn the Deities of Krsna from the brown stone of Vraja? Perhaps we shall never know for sure, but it seems obvious that somehow or other Rupa Gosvami had this knowledge and acted accordingly, choosing to manifest the Deity of Damodara from the brown stone of Vraja. 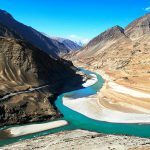 Next articleVrindavan and Barsana have just been declared official pilgrimage sites: what does it really mean?